There is a dessert called the Chocolate Snowball Cake that I've been wanting to make for ages. 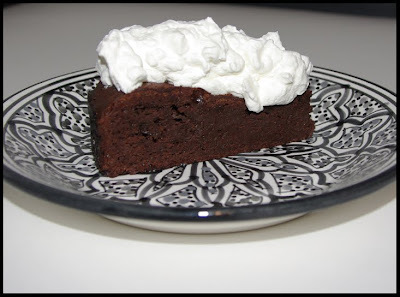 It's a flourless chocolate cake baked in a bowl and topped with whipped cream. It's a dense, chocolate dome covered in fluffy cream. Sadly, when I went to make this I couldn't find the metal bowl I thought I had, so I baked the cake in a 10-inch springform pan. Though the cake didn't have the rounded top, it still looked lovely and tasted amazing. This recipe makes a really big cake, so unless you're feeding a crowd don't cover the whole cake with whipped cream, just cover individual pieces; that way you can freeze any leftover cake to enjoy later. This is a really nice cake for special occasions as it's not complicated to make, it serves a lot of people, and it can be baked in advance. It's also delicious and tastes a lot like a huge fudge-y brownie. Perfect for all the chocolate lovers in your life. Too bad about not finding the bowl, but as long as it's tasty who cares? It sounds delicious. This cake would be perfect for Valentine's Day, Michele. It looks so decadent. That looks so tempting. Good tip about freezing it!